This is the second in a three-part series based on the notes and old manuscripts of my late Aunt Edna “Ed” Ione Gray (1920-1997). After “discovering” her genealogical work and family history in a box of papers, which was left to immediate family members after her death and subsequently given to me, the heir apparent of all things Gray Family, I excitedly transcribed what I considered to be her most stunning revelation in Part I: “My First Trip to Florida-A Brief Encounter.” Aunt Ed called the surprise ending, a “Divine Miracle.” Part III deals with Edna’s parents, my grandparents, Paul Barton (1892-1977) and Bertha Ione Campbell Gray (1893-1980), memories and reflections on them and their lives. Part II here is a collection of her stories in her own words, including some poetry written by her and my tribute to this beloved aunt based on my memories of her. Let’s begin, however, with her brief autobiography and a time before the births and marriages of most of her eleven brothers and sisters. It is dark. I am sitting in the back seat alone in a parked car, Dad’s Model T Ford sedan with a black hardtop. Mother is in the front passenger seat with infant Sara, one-month old, on her lap. Dad has taken the two older children, Ruth and Bart, to the movies, probably in Russelton where the first theater opened in 1920 with silent films. 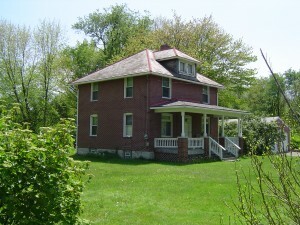 The growing family moved to Middlesex Township, southern Butler County, in the early 1930’s, after her father bought property there to construct a new and larger house. Edna graduated from eighth grade there in 1934. After matriculating from nearby Mars High School in 1938, she received a certificate from Butler Business College in 1943. 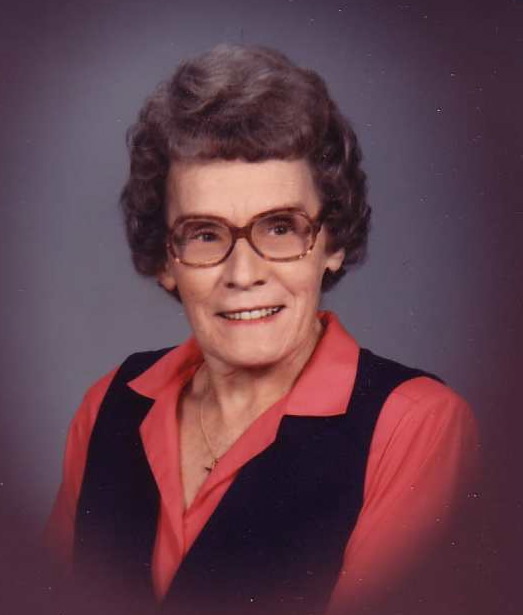 Her employment history includes time with St. John’s Lutheran Home, Butler Savings & Trust, a Civil Service position during World War II with Deshan General Hospital and afterwards with the St. Petersburg, FL, city tax office. Upon returning to Western Pennsylvania in 1946, Edna accepted positions in the Butler County Clerk of Courts office and in 1947, as Secretary to the County Superintendent. When the State established the Intermediate Unit system, her office moved north to Grove City. 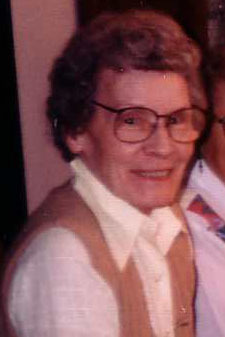 In 1980, after more than 32 years of service to public education, she retired at age 60. But, let’s hear some of the story in Edna’s own words, again from her memoirs. In October 1930, the little red brick, one-room schoolhouse in West Deer Township was closed. With our teacher Fern Morrow, we students, about 30, were transported by bus to the new 8-room Bairdford Consolidated School that had just opened for the 1930-31 school term. In February 1931, on a Friday evening, sister Ruthie [Pearce, editor Larry’s mother], aged 13 1/2, and I, then age 11, rode in another bus from the Bairdford School, got off at the Robert Aber farm on Saxonburg Boulevard, and walked over Starz’ hill to Grandpap William James Campbell’s farm. We were special guest for the weekend to celebrate his 72nd birthday on February 23. Grandpap baked the birthday cake for the occasion, which had white icing and a large “72” in pink icing on top. During the summer of 1931, I was visiting the home of Cousin Ella Mae Gray [later Grubbs] at Bairdford for a week. The two of us with several girls from her Sunday school class walked from Bairdford to the Grandpap Campbell farm, and then on out to Snitzer’s Corner, where Grandpap had to go each day for his mail. We met him, on horseback, returning from his daily ride for the mail. At that time he told our group of girls that he was just two weeks old, in March 1859, when his parents, Thomas A. and Jane Ross Campbell brought him to the Campbell farm. They had recently purchased the 95-acre farm, with only a log cabin, from the George McIntyre family. That fall 1938, the Balsiger’s daughter, Eleanor, a petite blonde lovely and spirited, was married to Harold Rodgers in a beautifully simple and solemn home wedding. My older sister, Ruth, who worked at the St. John’s Lutheran Home for the Aged just across the way in Mars, came over to help with the pretty reception for the bride and groom. I recall that we served a delicious luncheon which included chicken salad and wedding cake for the invited guests. Later, that year, on Monday December 26, 1938, Sister Ruth was married to Ralph Hill Pearce in a quiet wedding ceremony in the manse of East Union U.P. Church with the Rev. Howard Bruce officiating. Ruth became a full-time homemaker, and I took her position at St. John’s. I enjoyed my work at St. John’s for we were one big family with much affection and concern for the 25 old folks and 25 children who called St. John’s “HOME.” There was sincere Christian fellowship every hour of the day with special devotions each evening, holidays, and once-a-week worship service in the pretty little chapel with stained glass windows. In August 1940, I resigned this position to return home to help Mother [Bertha Gray], who had no one to assist in the care of our newest baby sister, Harriet June, who had arrived on June 3. My younger sister, Sara, was married to Charles Choura on June 24 by our Rev. William J. Dickey, minister at Glade Run U.P. Church. 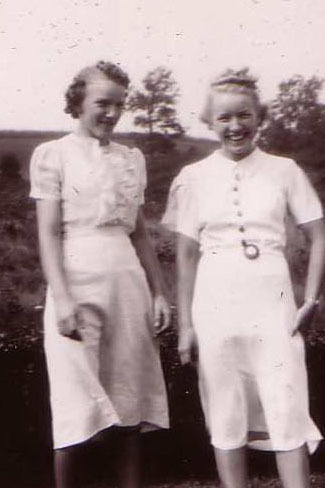 In leaving home to establish her own home in Butler, Sara took our next younger sister, Lois, with her. Lois secured work in Butler and lived with the newly weds. This left Mother with new baby Harriet, little sister Mary, only age 9, and five boys and Dad [Paul Gray] to care for without any significant adult help. The five boys ranged in ages from Bart, age 22, Bob 15, Merle 13, Stan age 7, and Lawrence age 5. Our little Harriet (1940-2002) had a really rough winter with much sickness. For days we had to hold her on a bed pillow because she was so frail and listless. In March 1941, when only 9 months old, the tiny bud took measles. But we nursed her through this very serious first winter. During that winter I worked as a substitute helper at the Heart House for Children in Valencia. This home cared for about 25 children from the Pittsburgh area who suffered from congenital heart defects. They were given much rest, good diet, and country-fresh air to aid in treatment for improving their weakened hearts. These children were all under 12 years of age. I remember that after their nap in the afternoon, which ended about 3:00, they lined up to each receive a tablespoon of cod liver oil. Despite having only a business college education, Aunt Edna was quite well-read. Her favorite authors were, by her own admission: Jane Austen, Louise May Alcott & father Amos, Emily Dickinson, Clementine Churchill, Victoria Lincoln, Elaine Showalter, Ralph Waldo Emerson, Lewis Carroll (pen name), William Wordsworth, Charles Lamb, John Adams & family, Fyodor Dostoyevsky, and more. Ironically, all these writers seemed to reflect great sadness in reflecting upon how short our lives are, so often filled with tragedy. Edna soaked in many facts and dates from history. How I wish I could sit down with her today and talk about her love of literature. I taught English and related course for twenty-one years at the college level and could probably hold my own with her; at least I’d like to think so. In addition to works of fiction, Edna loved history and culture. In her papers is a list she labels “Biographies I have read: Music & Art, Literary, Movies, Political, & Other Misc., 1980-1990.” It contains dozens and dozens of names from around the world. Her interest in local lore includes Western Pennsylvania history books, including Flood Tides Along the Allegheny, by Francis R. Harbison (1941), which contains the tale of Massey Harbison who was captured by the Indians (c.1792). Her father, my Grandfather Paul Gray, owned a farm on Harbison land in Middlesex Township, Butler County. Also included is the story of the small towns along the Allegheny River, Tarentum and Springdale, so near to West Deer Township where her ancestors settled. She often referenced Aunt Mary Gray Bryce, who married into the well-known Pittsburgh Bryce Glass Company. Not unusual in her collection is the likes of a homemade tablet, six small pages of notes held together with a rusty paperclip, on the American Revolution and George Washington, apparently from her Great-grandfather Thomas Anderson Campbell’s (1837-1925) beloved “History Book,” which she “gave to Flo Bostwick [perhaps her favorite Campbell cousin] Wednesday, August 28, 1996,” according to another attached note. Edna died the following year. Also not unusual was her fascination with history and literature’s many references to the Gray name: a description of one of Washington’s last meals at Gray’s Crossing, Philadelphia; quotes from criticisms of English poet Thomas Gray’s (1716-1771) “Elegy Written in a Country Churchyard,” to name a few. Finally, it doesn’t seem like Edna threw anything away. Along with carbon copies of letters to distant relatives, and their replies, are scribbled lines from her many dates at various local libraries to research family genealogy. Edna didn’t spend the money to Xerox much. After all, her professional education back then included stenography, note-taking, and how to use carbon paper. I can’t help thinking that she would absolutely thrive in front of a personal computer these days, with Google and saving files from all the online resources. Among her boxes of paper files and folders, I found perhaps the most poignant items saved of all: two appointment reminder cards for doctors’ visits, both marked “Cancelled,” one with her personal physician for February 7, 1997, and one for an oncologist for February 10, 1997. She passed away just a few months later. The flight of a snowflake from the sky. Touching the earth with never a sound. Time marches on, our lives wind down. The Great Master beckons each bungling clown. Like feathery snowflakes on an April day. But the soul lives on, vital and strong, continuing our force for right or wrong. Take heed, little one. Make your life count. Of life-giving water for a better world. That this life can impose. We can but sigh when it is gone. For each soul’s flight to His Promised Land. For God’s great world as it is today. And serve His masterpiece — Man! (February 17, 1985) “From time to time, God, in His infinite Wisdom and Providences, gives to His human creations, knowledge of His plans for them. He has been doing this from the beginning of time and doubtless will continue to do so until we have arrived at a state of religious perfection, so far as our finite minds can reach such a state. “The greatest of all these gifts of knowledge is/was the knowledge of His plan of salvation as contained in the life, death, and teachings of Jesus. Sundays at our house meant church and Sunday school before lunch followed by a visit to one of the grandparents. While my Grandma Pearce lived the final years of her life about 10 miles north of us in the small city of Butler, Grandma and Grandpap Gray lived in a corner of what was left of their farm just a few miles down the road toward the Borough of Mars. With many of their off spring still in the area, the Gray household was usually packed with descendants of every description, but I mostly remember the grandchildren, my cousins. It seemed to be Aunt Ed’s job to round them up and take them off on a walk, so the parents could visit. 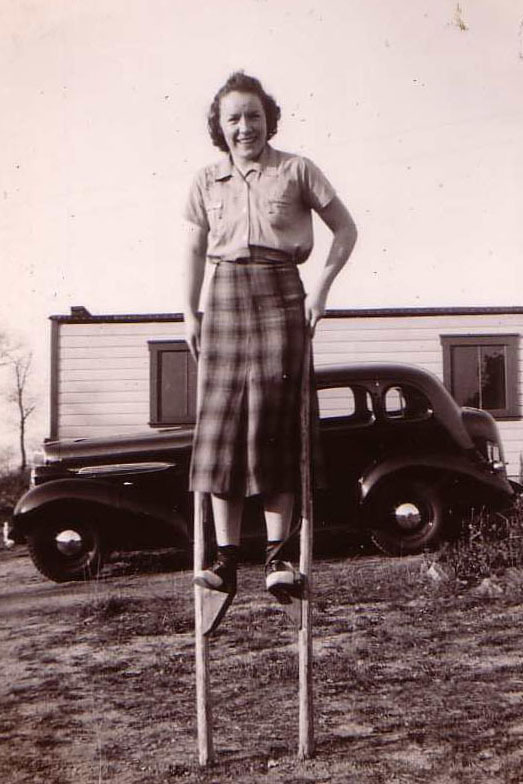 I was one of the delighted kids who hiked to the top of nearby Gobbler’s Knob, across the road to Park’s dairy farm, or any of a dozen other places where Aunt Ed could stimulate our imaginations. Sometimes it was observing the wildlife: birds, deer, rabbits, etc. Sometimes it was a lesson in right living, vigorous exercise, or healthy eating. I remember Aunt Ed eating every last bit of an apple she had brought along, including the seeds. Later I thought I read where apple seeds contain enough tannic acid to kill a person. The truth is that many fruit seeds contain cyanide, which in small doses is survivable, but the bottom line is that dear Aunt Ed was probably not doing us kids any favors in eating entire apples. To this day I wonder if her raspy voice and relatively early death of throat cancer could have been cause by her eccentric diet. As I grew older, went off to college, married, and had my own children, Aunt Ed became just a sweet memory. I saw her at family reunions, birthday parties, weddings, and funerals. Now that I am so deeply involved in genealogy, I’d give anything to be able to sit down with her and ask her what it was like for her growing up in rural Pennsylvania and how she knew what she knew about our family history. Never marrying, she seemed to have all the time in the world to explore these questions. She volunteered extensively at the Butler County Library. During a recent visit I saw books that had been donated, mostly history and biographies, with acknowledgment stickers thanking her. Also, there is a plaque in the new multi-purpose room of the Glade Run Presbyterian Church, of which she was a life-long member, noting a significant donation after her death. As we said in Part I, Aunt Edna was known for her self-sacrifice, and I’m convinced that family, faith, and education were her top priorities, all intangible things that involve sharing with others. This brings us to Part III: “Memories of my Parents,” short pieces that Aunt Ed had intended to compile in honor of her parents. Unfortunately, she passed before completing this project. If you’re family or a friend of Edna Gray and can contribute a reflection of her or our family, please use the response space below, and we’ll share it with our readers.